AFTER TWO MONTHS of intensive research, we are forced to admit failure — once again — in our perennial quest to definitively answer a question that has plagued civilization since the discovery of the cooking fire: what is the best pie apple? Our failure was not due to a lack of effort, and we had the help of prodigious pie-makers from across the region. 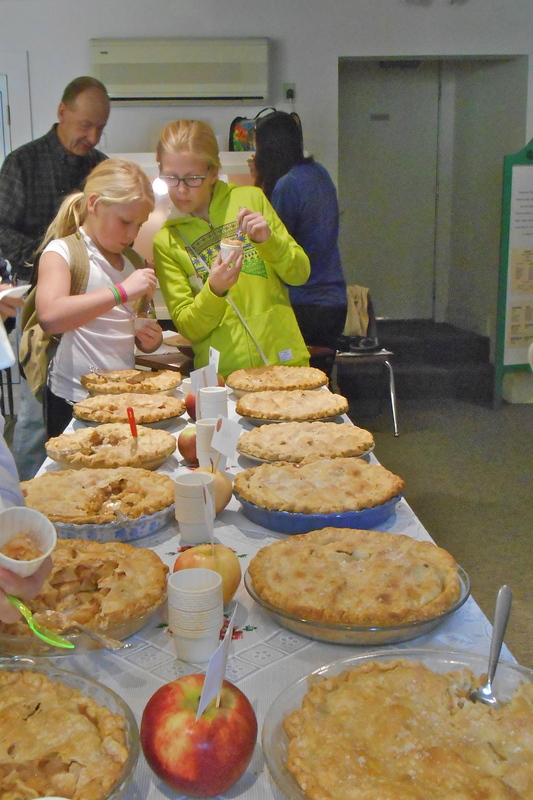 We began by baking, inhaling, and serving more than 2,000 five-inch, single-serving apple pies at the Eastern States Exposition (“The Big E”) for 17 days in September, and tasted not a few of them. We talked pies with Kim Harrison, one of a team of volunteers that made the pies to raise funds for The Preservation Society in Granby, Massachusetts. We spoke with dozens of customers about the merits of one variety over another. The Big E pies have a flaky top crust covering a filling of several varieties lightly spiced. Many people topped off their pie with vanilla ice cream, a few with thin slices of cheddar. The apples were supplied by five Massachusetts orchards: Cold Spring Orchard in Belchertown, Clarkdale Fruit Farms in Deerfield, Nestrovich Fruit Farm in Granville, Pine Hill Orchards in Colrain, and Red Apple Farm in Phillipston. Its flavor and aroma are so good that most people forgive McIntosh’s tendency to break down when baked, and add at least some to any varietal mix. Akane, an early season apple developed in Japan in 1937 and introduced in the United States in 1970, was also noteworthy in this year’s pies for its lightly tangy flavor and texture. In our informal survey of visitors, opinions about the best pie apple ran the gamut, from heirlooms like Baldwin (Wilmington, Massachusetts, 1740) to recent entries such as Pink Lady (Australia, 1989). Northern Spy (East Bloomfield, New York, in 1840, from seeds from Salisbury, Connecticut) has a particularly loyal fan base. The closest we came to discovery, though, was the radiance of a woman purchasing 14 Gravenstein apples, an early season heirloom from Europe that dates back to at least the 1600s. The now hard-to-find Gravs were popular in New England until the bitterly cold winter of 1933-34, when many of the trees perished (along with more than one million Baldwin trees). It has never recovered as a commercial apple, but can still be found at some orchards. Pie preferences are often passed down from generation to generation. The woman purchasing 14 Gravensteins put six in her bag at first, and as we talked she kept adding to her total until she got to 14. She planned to make two pies with them, just the way her mother did. It was not the first time during our years at The Big E that the sight of Gravensteins has inspired such passion, and we suspect it will not be the last. I have not made a pie using just Gravenstein, but if it is as good baked as it is eaten fresh, the woman may be on to something. The apples were special, bursting with juice, with a lightly crisp, lemony tart flavor. The flavor of nearly all of the varieties cited at The Big E, we noted, is more tart than sweet. That’s not to say that you can’t make a great pie using sweet apples, but a hint of tartness lends a pie complexity and zest. 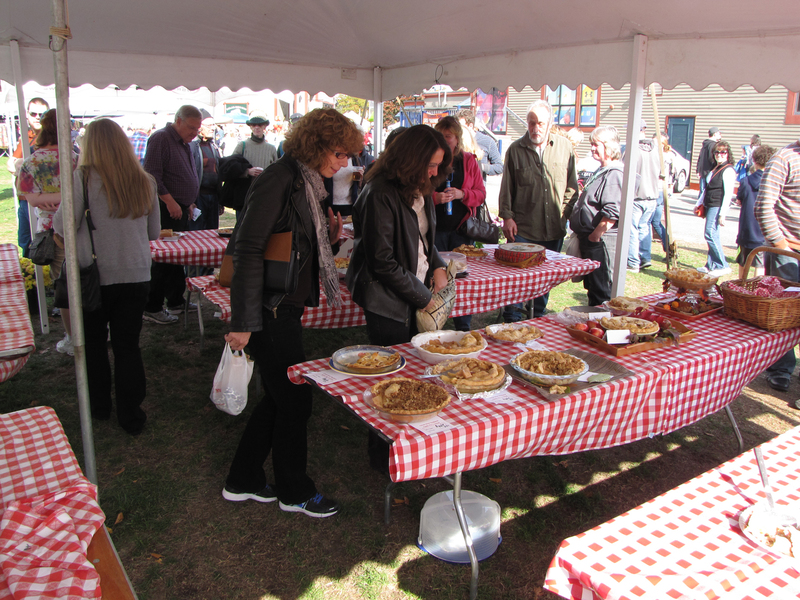 NEXT WE TRIED immersion, serving as judges in the 5th Annual Great New England Apple Pie Contest October 18 at Wachusett Mountain’s annual AppleFest in Princeton, Massachusetts. We dutifully sampled 30 pies in less than two hours, using the two-bite method: an introduction to the pie, and a second impression. It is the only way to do justice to this many pies. 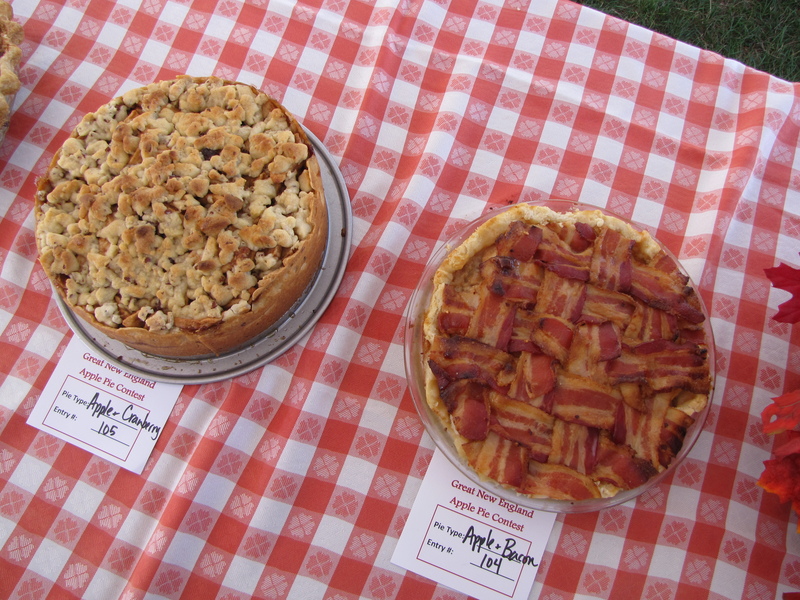 There were some incredible-looking pies — entries are judged on appearance and presentation as well as flavor and texture — in two categories, Apple Only and Apple And Other. Several had latticed or elaborately sculpted crusts, including the winner of Apple Only, Theresa Matthews of Gardner, Massachusetts. The judges, in addition to me, were Bar Lois Weeks, executive director of the New England Apple Association, for the third year; local businessman Burt Gendron, a veteran pie taster; Julia Grimaldi, representing the Massachusetts Department of Agricultural Resources; and radio personalities Chris Zito of WSRS and Ginny Sears of WTAG, both in Worcester. We did not know the varieties used in any pie, although we were able to identify McIntosh flavor and texture in some, and make good guesses about Cortland, an 1898 cross of McIntosh with Ben David, similar in flavor to McIntosh but larger and firmer. Most of the entries were good to very good, with several reaching exalted status. The few low-scoring pies suffered more from lackluster crusts than poor apple flavor. One pie pairing pears with apples tasted mostly of apples — finding a balance that allows the milder pear flavor to come through can be tricky. But apples and pears is a proven combination, well worth the effort to get it right. Other ingredients in Apple and Other were caramel, cranberries, cream cheese, raisins, walnuts, and Jack Daniels. They all worked well with this versatile fruit. Apples in a number of pies had been sliced by a mandolin slicer, and generally this did not improve the pie’s texture. The thin, uniform slices often stick together in a stack, which can lead to uneven cooking and consistency. 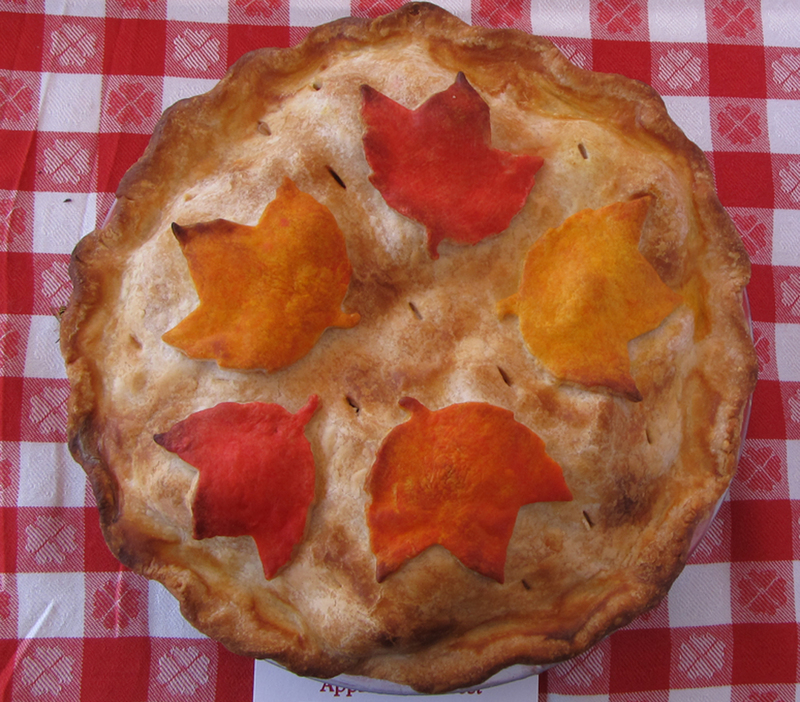 Theresa Matthews used only Cortland apples in her winning Apple Only pie. Both contest winners in 2012 also used just Cortland. Could this make Cortland the undisputed champ? FROM THERE we conducted another experiment, at the White Memorial Conservation Center in Litchfield, Connecticut. Chef Gerri Griswold baked a dozen pies for our October 25 apple talk and tasting event, two each using single varieties: Cortland; Empire, a 1945 offspring of McIntosh, crossed with Red Delicious, released in 1966; Gala (New Zealand, 1934, 1970), Honeycrisp (Minnesota, 1961, released in 1991), Macoun, a 1909 cross of McIntosh with Jersey Black in New York, released in 1923); and McIntosh. Gerri scrupulously followed the Joy of Cooking apple pie recipe for all 12 of her creations, using the same prepared Pillsbury crust. 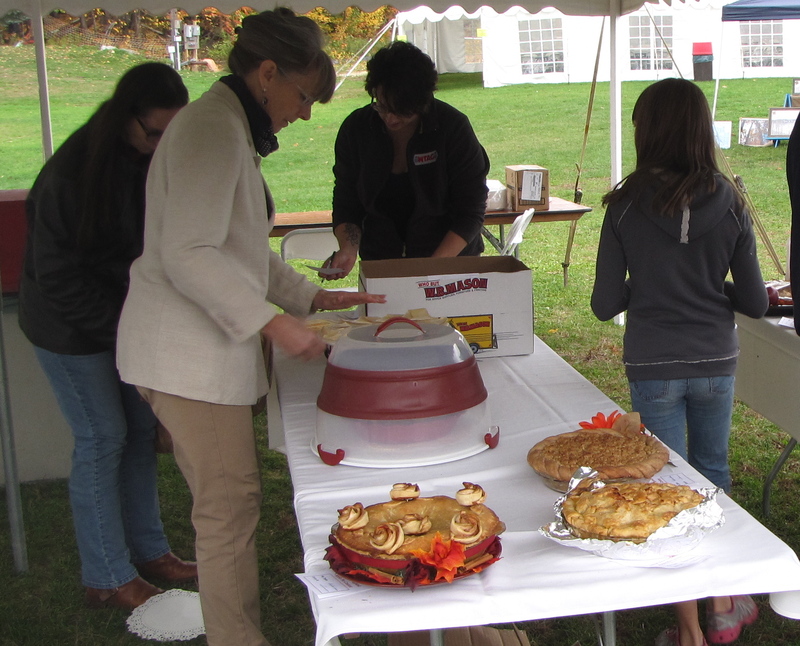 We sampled each pie several times, as did the 20 or so people of all ages in attendance. A sheet of paper nearby for our scores and comments went mostly untouched, as most people were content to savor the experience. There was plenty of excellent pie, but no clear-cut winner. Cortland had the most support in an informal poll, but the Empire, Macoun, and McIntosh pies all had champions. The McIntosh pie had surprisingly firm texture, soft but not mushy, and holding together. Gerri had tried a similar experiment during our first appearance at White Memorial two years ago, baking four pies using single varieties. On that day, Mutsu, a large yellow apple discovered in Japan in 1930 (also known as Crispin), was the favorite pie apple. The pies made with the sweet Gala and Honeycrisp apples did not fare as well as the others. For most of us, they were a little too sweet and their flavor lacked character. Gerri acknowledged that were it not for the taste test she would have reduced the sugar in the pies made with these varieties. WE CONTINUED our study this past Sunday, November 2, during Franklin County CiderDays. 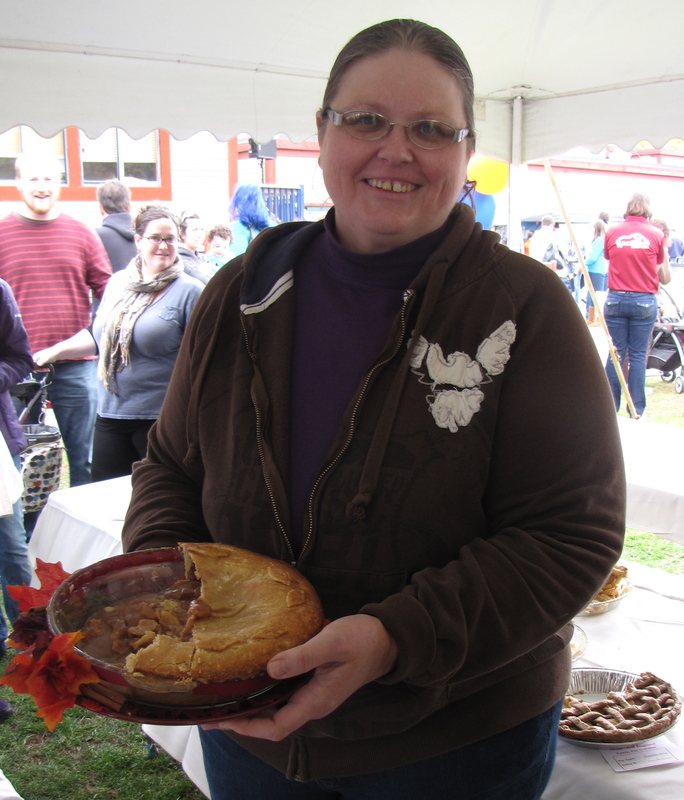 Sue Chadwick, who grows a wide range of rare heirloom apples at her Second Chance Farm in Greenfield, Massachusetts, kindly donated a pie for our research, one of just three left from the 20 she baked to sell at the event the day before. 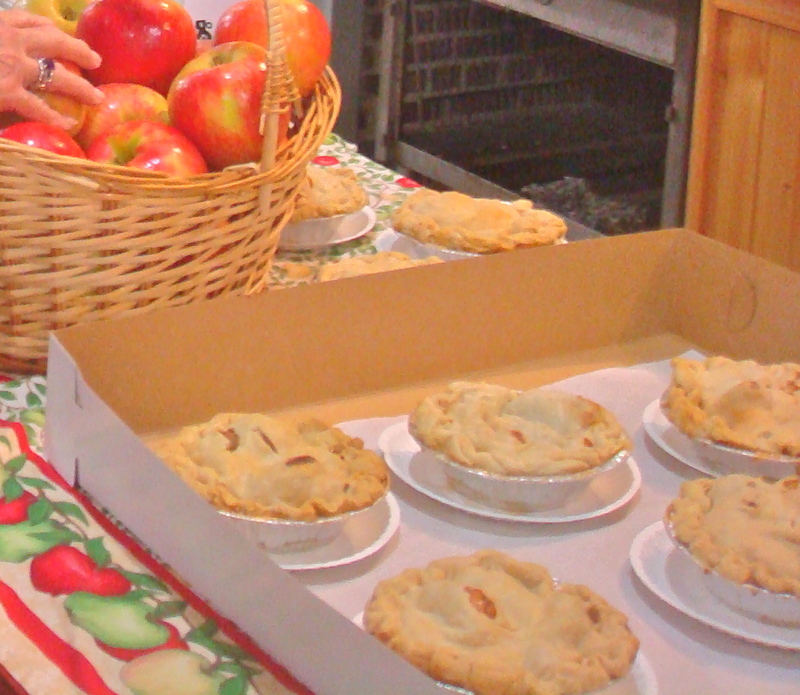 Sue uses a mix of apples in her pies, and the varieties could be different every time. Even if she could tell exactly what went into each pie, it would be hard for most people to find the apples to replicate it. The pie she gave us had rich apple flavor, as good or better than any made with a single variety. Having made such little progress, we are going back to view Andrea Darrow’s three-part video series about apple pie-making, below. Andrea, of Green Mountain Orchards in Putney, Vermont, bakes hundreds of apple pies every fall, peeling every apple by hand. She uses several varieties, including Cortland and McIntosh, and piles them high. She did get it right. Here is the recipe for Theresa Matthews’ first-place pie. In a food processor bowl place flour, salt, sugar, butter, and shortening. Cover and pulse until blended about the size of peas. While running the processor, pour cold water in a steady stream until pastry ball forms. Divide into two balls, chilling for at least 30 minutes. Roll out one crust on lightly floured parchment paper 1” larger than pie tin. Carefully transfer pastry to pie tin, and try not to stretch to avoid shrinking. Take egg white and brush onto entire bottom crust and refrigerate for 15 minutes or until filling is set. Melt butter in a saucepan. Stir in flour to form a smooth paste. Add in water, sugars, and spices and bring to a boil. Reduce temperature to a simmer. In a large mixing bowl place sliced apples. Pour sauce over apple slices and mix carefully to keep apple slices whole. Carefully spoon coated apple slices into bottom crust, mounding slightly. Take care not to pour too much liquid to run out, reserving 2 T sauce. Brush bottom crust edge with egg whites and cover mounded apples with top crust, trim and press to seal. Cut slits for steam to release during cooking and brush glaze onto top of pie. Cut pie dough scraps into the shapes of leaves and arrange them on the pie where the rose tarts will be placed. Brush glaze over leaves. Save remaining pie dough for Apple Rose Tarts (recipe below). Place in preheated oven and lay a sheet of aluminum foil over pie to prevent burning. Bake 60-75 minutes or until deep golden brown. Cool. Serve as is or with ice cream. Makes one 9” pie. Add apple slices to a pan of sweet syrup, making sure to cover all apples. Cook over medium-low heat until apples are pliable. Roll out remaining pie dough in a rectangle about 8 to 10 inches wide and 10-12 inches long. Cut 8-10 one-inch wide strips along dough’s length. Place tarts on parchment paper about 2 inches apart and bake for 25 minutes or until brown and bubbly. Once tarts are cool, remove from parchment and using toothpicks insert into place on baked and cooled apple pie. 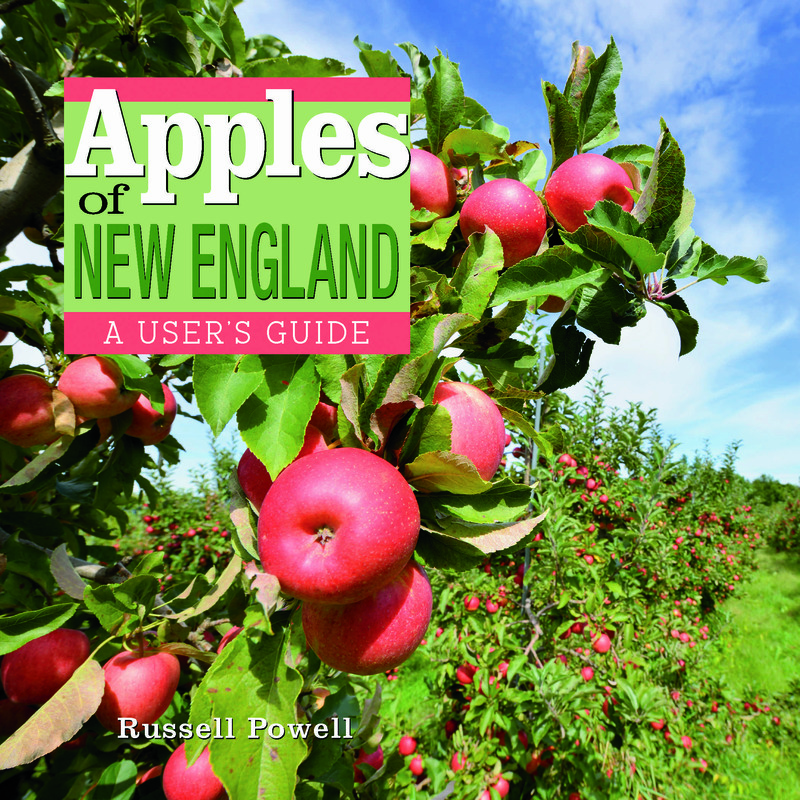 APPLES OF NEW ENGLAND (Countryman Press, 2014), a history of apple growing in New England, includes photographs and descriptions of more than 200 apple varieties discovered, grown, or sold in the region. Separate chapters feature the “fathers” of American wild apple, Massachusetts natives John Chapman (“Johnny Appleseed”) and Henry David Thorea; the contemporary orchard of the early 21st century; and rare apples, many of them photographed from the preservation orchard at Tower Hill Botanic Garden in Boylston, Massachusetts. Author Russell Steven Powell is senior writer for the nonprofit New England Apple Association after serving as its executive director from 1998 to 2011. Photographer Bar Lois Weeks is the Association’s current executive director. AMERICA’S APPLE, (Brook Hollow Press, 2012) Powell’s and Weeks’s first book, provides an in-depth look at how apples are grown, eaten, and marketed in America, with chapter on horticulture, John Chapman (aka Johnny Appleseed), heirloom apples, apples as food, apple drinks, food safety insects and disease, labor, current trends, and apple futures, with nearly 50 photographs from orchards around the country. The hardcover version lists for $45.95 and includes a photographic index of 120 apple varieties cultivated in the United States. 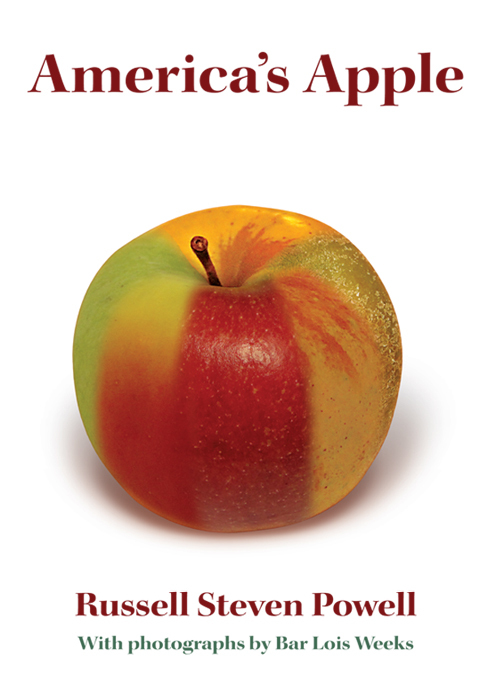 America’s Apple is also available in paperback, minus the photograph index, for $19.95, and as an ebook. Available at numerous bookstores and orchards, and Silver Street Media, Amazon.com, Barnes and Noble, and other online sources. For quantity discounts, email newenglandapples@verizon.net. JUDGING BEGAN earlier this year, late morning rather than early afternoon, and that meant a change in routine. Like a finely-tuned runner on marathon day, I had to carefully consider what to eat, and when, in advance of the competition, my fourth time serving as a judge at the annual “Great New England Apple Pie Contest.” The event was held Saturday, October 19, during the first day of Wachusett Mountain’s weekend-long AppleFest. I needed just enough to blunt my appetite so that I would not be tempted to wolf down the first few entries. Caution is the word when you have to taste more than 40 pies in two hours; to continue the running metaphor, if you go out too fast at the beginning of the race, you will pay for it later on. For the same reason, I needed to go light on breakfast. Too much food in my stomach and I might not make it through the day’s pies. I chose a small bowl of cereal about three hours before the judging began. Now in its fourth year, the contest has grown in size, resulting in the earlier start. For the second year, Rick Leblanc of the Massachusetts Department of Agricultural Resources joined New England Apple Association Executive Director Bar Lois Weeks and me on the five-person panel of judges, with on-air radio personalities Chris Zito of WSRS and Ginny Sears of WTAG, both in Worcester. 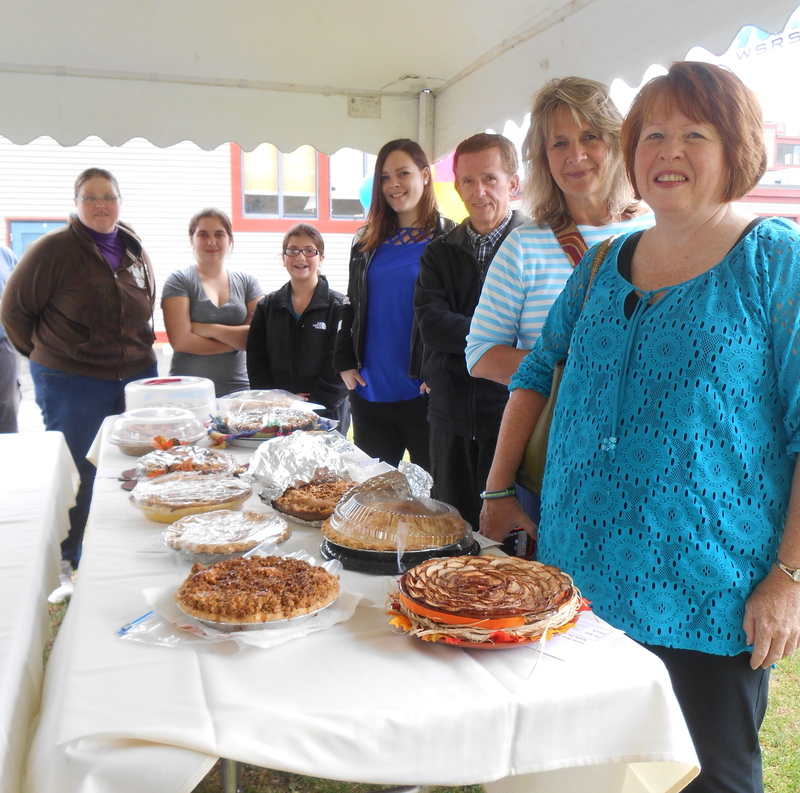 THE RED-AND-WHITE checkered tables beneath a tent and a crisp October sky gave the event the informal atmosphere of a bake sale or church supper. 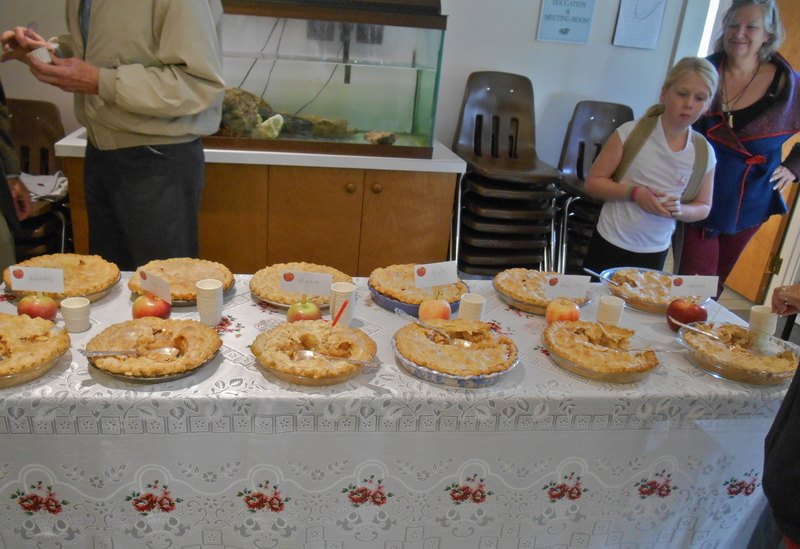 But the long tables were laid out with impressive-looking apple pies of all descriptions, no two exactly the same. 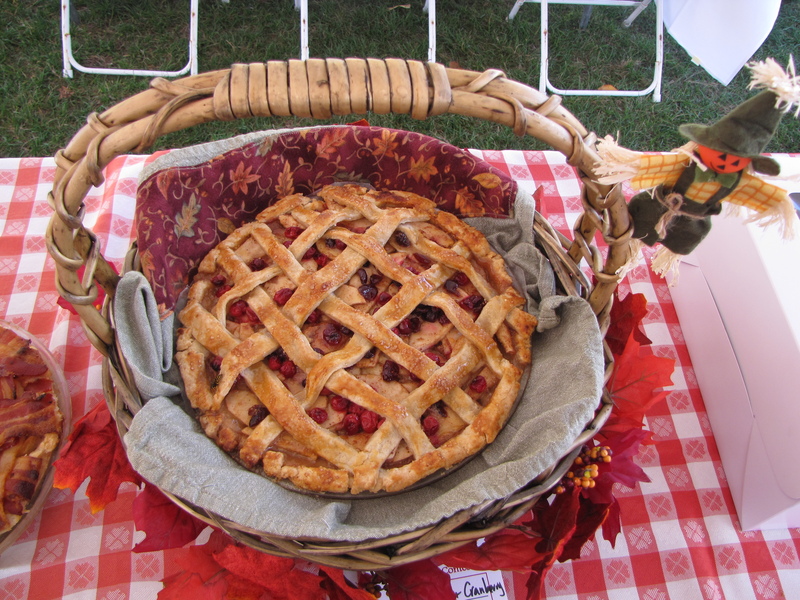 Some pies had elaborately sculpted, crumb, or latticed crusts, some were arranged artfully in picnic baskets or surrounded by apples and foliage. Others came with no frills — just straightforward apple pie. The pies are graded on presentation and appearance, but this is largely subjective, and in any event we judges agreed that the greater weight in our scores should go to flavor, crust, and texture. When it comes to looks, though, I am more partial to a beautiful, hand-crafted fluting around the pie’s edges than I am to a nice container, although both contribute to the pie’s sensory pleasure. It is hard to make generalizations after sampling the efforts of 43 different bakers, mostly women. Almost any apple variety — or combination — can succeed in a well-made pie. Apple pies should be lightly spiced; I love nutmeg, but a little goes a long way. Less sugar usually means more apple flavor. A consistently flaky crust can take years of practice. WE BEGAN with eight pies in the “Apple and Other” category, and there were some outstanding ones with cranberries and pecans. 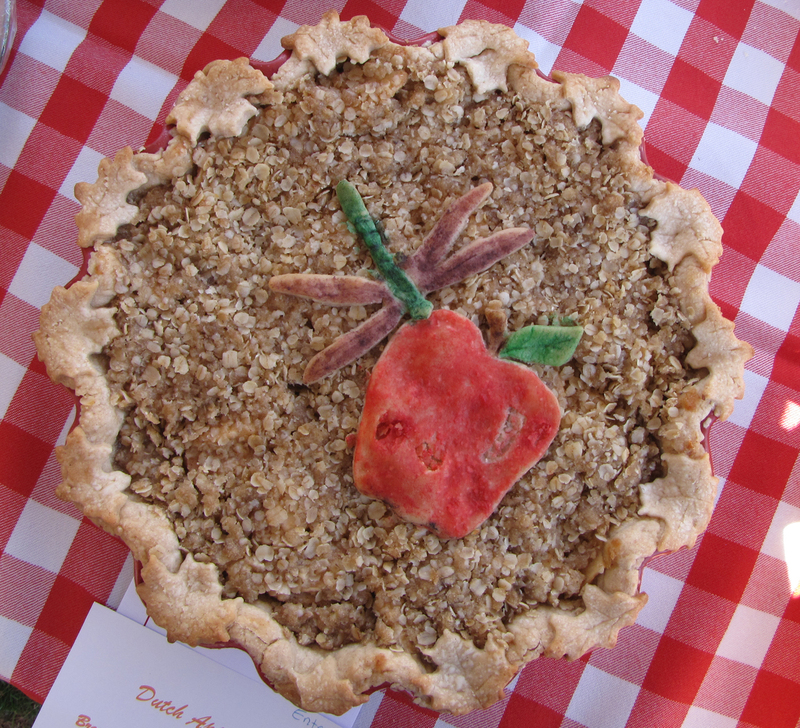 Last year’s winner in the “Apple Only” category, Patricia Kuhn Bonita of Winthrop, Massachusetts, entered a pie featuring apples with Asian pear, but the pear flavor did not come through. Bonita, a veteran pie-maker and winner at other contests, took the feedback in stride, especially since her friend, Anita Mochi, also of Winthrop, won the category with her Apple Praline Pie. Then it was on to nearly three dozen “Apple Only” pies. Pacing myself with just two bites of each and cleansing my palate with water in between, I was fine until the last six or seven. I was able to maintain my focus during the judging, but for the first time I looked forward to the end. Every last bite was worth it, though. 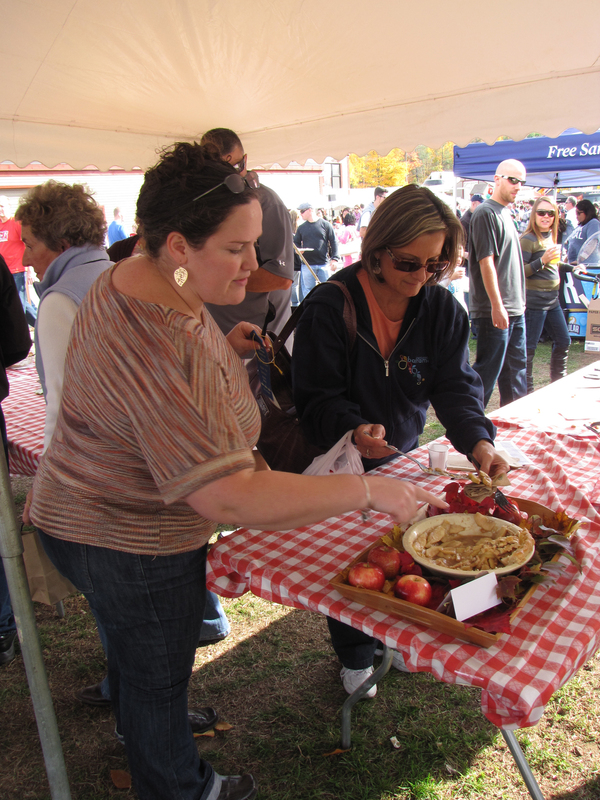 Lori Meiners of Hubbardston, Massachusetts, won first prize in the “Apple Only” category with her delicious rendition of New England’s favorite dessert. The final scores were close, and we had to resample two pies in order to decide between the second- and third-place winners. It is inspirational to see the combined efforts of so many proud and imaginative bakers, and humbling to evaluate their delicious but perishable works of art. I hope I am invited back to try again next year. In a large bowl, use a fork to mix the flour, sugar, and salt. Cut in the shortening until mixture is crumbly. In a small bowl, gently whisk together vinegar, egg, and water. Add egg mixture to flour mixture, and stir until just combined. Divide dough into four portions, quickly form into discs, wrap in plastic or waxed paper, and chill for at least 30 minutes. Peel, core, and slice the apples into a large, heat-proof bowl. Pour boiling water over apples until just covered, cover bowl with plastic wrap, and set aside for 10 minutes. Drain water and set aside. In a small bowl, mix together sugars, cinnamon, nutmeg, and flour, and set aside. Preheat oven to 350°. Roll out the dough: generously flour flat surface and both sides of the dough. Roll out to 1/4″ thick. Place in pie pan. Pour apples into pan. Add butter pieces, spread out on top of apples. Pour sugar mixture over apples. Roll out top crust and place over apples. Trim edges so there is about 1/2″ of dough hanging over edge of pan. Fold dough under and pinch to seal. Cut several slits in the top crust to vent steam while baking. In a small bowl, mix egg yolk, sour cream, and water, and paint over top crust. Place pie in preheated 350° oven for 35 to 40 minutes until crust is golden brown. Remove from oven and place on cooling rack. Serve warm or at room temperature with vanilla ice cream, if desired. In small saucepan, melt 1/4 c butter, 1/2 c brown sugar, 2 T cream. Bring to boil. Remover from heat and stir in 1/2 c pecans. Spread over pie shell and return to oven for five minutes.